How Many Porta Potties Do I Need for My Event? 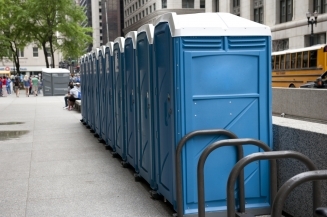 If you’ve decided you need porta potty rentals for your event or work site, the first question you might have about your portable sanitation needs is how many porta-potties you’ll need for the event. Also, you may need to decide whether you need additional services like hand washing stations, as well as servicing of the units for the duration of the job or event. Fortunately, it’s quite simple to figure out how many porta potties for rent you’ll need for your event. Not only can a professional sanitation company like Got To Go Solutions help you with your calculations, but you can also perform some simple “napkin math” to get an idea of the number of potties you’ll need. Here are the details you’ll need to think about when discussing your event or site need for local porta potty rental. Simple multiplication is all you need to figure out how many porta potties for rent you’ll need to secure for your event. You’ll want to take the number of days you’ll need the toilets and how many guests or employees you expect to attend. Further, you’ll need to consider the length of each day and whether food and drink will be served or available as part of the event. For example, imagine you’re hosting a backyard barbecue in your suburban home. You might not have enough toilets inside your home to accommodate your guests. If your barbecue will last a single day and you expect around fifty people to attend, a single porta potty will probably suffice. However, if you’re hosting a weekend music event and expect 10,000 attendees over the course of three days, you’ll probably need to secure around 75 porta potty rentals. When your event requires dozens of porta-potties, the addition of hand washing stations is something to consider. Tip: If your event features alcohol (like a wedding reception might), portable sanitation experts recommend increasing the number of porta potties you rent by twenty percent. Don’t Forget: You may want to consider one or more handicap porta potties at your event. A disability accessible toilet ensures all guests or employees can use the toilet, and the large size of such toilets is helpful for families, too. If your event lasts more than a few days, as might be the case with a construction site or other semi-permanent arrangement, you’ll need to determine a schedule for servicing your potties. Whether you choose traditional porta potty rentals or deluxe restroom trailers that feature flushing toilets and a holding tank, those facilities will require waste removal and replacement of paper goods and sanitizer. Consider: If you’re thinking about reducing the number of porta potties you’ll rent to save on your budget, cutting back on bathroom facilities isn’t the place to make changes to your event planning. Are you hosting a festival in Fort Worth? Are you arranging a family reunion at a park in Denton? Will you need porta potties at your construction site in Decatur? Got To Go Solutions is your experienced, affordable, and courteous solution for porta potty rentals and portable sanitation services. Contact us today to see how we can ensure your guests, friends, employees, or anyone who needs to use the toilet at your event can do so without worry and in a clean and sanitary environment.